Facebook has globally rolled out the ‘Messenger Day’ feature for iOS and Android users. Along with that it is also released for desktop messaging threads. Similar to SnapChat or Instagram stories and WhatsaApp status, Messenger day lets you share decorated photos and videos with the public or a custom friend that disappear after 24 hours. The photos or videos can be customized with text, stickers and frames. Moreover, Messenger day allows you to choose who you want to share your story with as you’re sharing it. 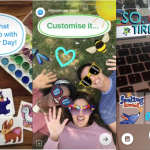 From a very long time, Facebook has been duplicating the features of SnapChat for all its products including Instagram and WhatsApp as it considers SnapChat one of its close competitor and is worried with large number of users of SnapChat. First, they evolved a story like feature for Instagram. And then a couple of days ago on the 8th year completion of WhatsApp, WhatsApp Status feature similar to Snapchat and Instagram stories was announced. Facebook began testing the ‘Messenger Day’ feature in last September firstly in Poland and then it was expanded to Australia in October.